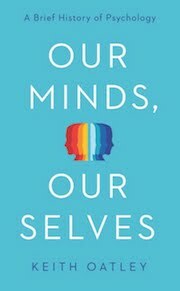 When people ask about our finding that readers of fiction had better empathy and other social skills than readers of non-fiction (Mar, Oatley, Hirsh, dela Paz & Peterson, 2006, accessible in our archive of academic papers by clicking here) they sometimes say: "So, what's a good novel to read?" I feel tempted to reply: "Anything by Jane Austen." 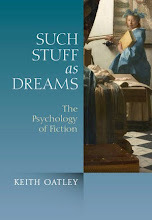 From the point of view of our research findings, all Austen's novels involve theory of mind. Readers need to attune to what characters may be feeling and thinking, even when clues are sparse. More especially, it seems to me that one of Austen's pieces of deep originality was her invention of the novel of social explanation. (We have made an argument for this in a recent paper: Keith Oatley & Maja Djikic, 2008, Writing as thinking, Review of General Psychology, 12, 9-27). Think of it like this. It is generally said that the detective story entered literature with Edgar Allan Poe's short-story "The murders in the rue Morgue" (1841) and in its longer form with Wilkie Collins's novel The moonstone (1868). Both are based on the urge to discover and on explanation; and of course stories of this kind have remained immensely popular. 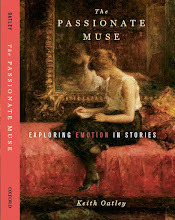 But Austen was ahead of Poe and Collins with a story of gradual discovery and explanation: Pride and prejudice (1813). Austen's novel is a story not of forensic but of social explanation: why was the very eligble Mr Darcy rude to Elizabeth Bennet at a ball? There are, of course, innumerable puzzles in literature, for instance the question of how Oedipus could know who his mother was, or indeed how Tom Jones could know who his mother was. But I submit that these puzzles are different, and that it was Austen who conceived the novel based on social explanation. If she had predecessors in this, I would be pleased to hear of them. Explanatory hypotheses for Darcy's rude behaviour begin immediately after the ball. Did it occur because, as Mrs Bennet says, Darcy is "a most disagreeable, horrid man?" To find out, one must read on, and as one passes, Alice-like, into the world of the novel, one also finds oneself in the kind of simulation of selves in interaction that can enable one to sharpen one's social acumen. I don't think I understand the argument well, but I don't see how your example is particularly different than scenes in earlier novels by Richardson, Burney, Edgeworth, Prevost, or Laclos. "Social explanation" would seem to be a central component of the modern novel. Thank you so much for this comment. I was hoping that people would let me know if I had gone astray in my proposal that Jane Austen invented the novel of social explanation. Perhaps I should have said: "social investigation and explanation." Here is how I see it. Pride and prejudice is a novel about investigation, discovery, and explanation, in the social world, in the same way that Edgar Allan Poe's and Wilkie Collins's stories are about investigation, discovery, and explanation, of crimes. That is to say, Austen's plot-engine in Pride and prejudice starts up with the question: "How can the eminently eligible Darcy have behaved so badly?" The elegance of the investigatory device is made psychologically profound, I think, by the tracing of how coming to love someone has little to do with the glance of a stranger across a room, but is itself a kind of investigation and explanation, a gradual coming to know the person. I totally agree that the modern novel involves explaining its characters, especially the protagonist. You mention possible forerunners, such as Richardson and Laclos. Certainly, as a protagonist encounters unexpected events and temptations, as Richardson's protagonist does in Pamela, we come to know the character better. But the plot engine here seems to me something like how we progress from ignorance to experience of the world. Similarly, in Laclos's Les liaisons dangereuses, although the contenders keep from each other what their goals are, the plot engine seems to me to have to do with social power and hypocrisy, rather than investigation and explanation as such. At an Edinburgh Festival, some years ago, I heard P.D. James talk about why the detective story holds such appeal. She said that the appeal is based on a wound having been inflicted on the body of society. By sheer cerebration, the detective works out not just who caused the wound, but what kind of person this was. With the conclusion of the investigation—in the fantasy, as it were, of the detective story—the wound is healed and life can continue. Austen, it seems to me, had a comparable insight. In Pride and prejudice she asks: "What kind of person, seemingly the very acme of gentlemanliness and eligibility, can have caused a social wound?" The wound is healed by investigation, explanation, and acknowledgement. I have not read Fanny Burney. in a recent discussion of this issue, David Miall suggested to me that I read her. I have it in mind to read Evelina. But I wonder if another of Burney's books might be better. This elaboration of "social explanation" seems worth following, particularly in this more detailed form of "investigation, discovery, and explanation." 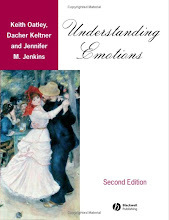 From what you say, it seems more like Austen develops a form of the novel mediated through theory of mind, rather than more simply generating a novel form based on social explanation. Arguably, the Epic of Gilgamesh involves some serious social explanation, as does Beowulf -- they explain dynamics (and very social politics) by which societies interact socially and with their environmental contexts (and the symbolic and material unknown). But they're much less explicitly about investigation, discovery, and explanation, as much as we might be tempted to impose these categories as modern readers. But what about Shakespeare? Am I imposing categories unduly if I consider Romeo and Juliet a play (granted, not a novel) about investigation, discovery, and explanation? In the context of your post, it seems that the theory of mind you mention might be a signal difference between Romeo & Juliet and Pride & Prejudice. We are not exactly asked to inhabit or infer the psychological states of Shakespeare's characters so much as to witness them (although this may well be a difference of medium). Perhaps Collins provides a useful case for this line of thought. Could you say that the reader is more of an external spectator to the investigation, discovery, and explanation for him, and more of an *embedded* spectator for Austen? Thanks very much for this comment, Valentine. It helps me a great deal with the problem I have been thinking about. I first started this thinking when I heard a talk by Heather Jackson (see, e.g., Jackson, H. J. April 7 2006, Raising the unread: Mary Brunton and Jane Austen. Times Literary Supplement, 14-15) in which she said it has been impossible for scholars to say what it was about Jane Austen that was original, because for every idea that has been nominated, for instance her treatment of moral dilemmas of marriage for women, or her use of free indirect style, people have come up with predecessors. So, of course, this set me going, and this is why I came up with the idea that Austen invented the novel of social explanation, or better, the novel of investigation, discovery, and social explanation. And now, in what Jackson has taught us is the proper way, you come up with predecessors for that too: the famous author Anon who wrote in cuneiform The Epic of Gilgamesh, and Wm Shakespeare, who wrote Romeo and Juliet. And it is difficult to avoid agreeing with you. After the death of Enkidu, Gilgamesh does embark on a kind of investigation and a journey of discovery. And not long after the initial skirmish in Romeo and Juliet, Benvolio does begin a kind of investigatory experiment on the nature of Romeo's love. But, more helpfully than many other counter-arguers and precursor-offerers, you take the hypothesis forward. Perhaps, as you propose, Austen offers a more personally involving investigation than in Romeo and Juliet, in which, as you put it, we witness the characters rather than empathetically inhabiting their psychological states. And I agree, also, that in this Austen can be thought of as different from the writers of forensic stories of investigation, discovery, and explanation, such as Wilkie Collins, who came after her. I agree that part of the appeal of the forensic detective story (as compared with Austen's kind), is for the reader to be, along with the detective, not engaged fully with a character, but a bit above it all. This aspect is rather nicely brought out in Kate Summerscale's recent book (2008). The suspicions of Mr Whicher. (Vancouver: Raincoast) about an actual country-house murder mystery in the English county of Wiltshire, in 1860, in which only someone who lived in the house could have been the murderer of a three-year-old boy, son of the householder and his second wife. The case was investigated by Jonathan Whicher, the brightest of Scotland Yard's recently established team of detectives. Clues were sparse, and the case was unclear, but so engaging that journalists in what seem to have been half the newspapers in England started being detectives too, and laying allegations on one or other of the dozen members of the unfortunate household, as well as on the policemen and magistrates. The case was a great influence on Wilkie Collins. So: I think you are right that theory of mind has a lot to do with Austen's originality. I shall keep thinking.